Puddles of Myself: Puddles of My Mad Men Season Six: "A Man With A Plan"
It never fails. Each season, there’s always an episode of Mad Men that I have trouble really attaching my mind to. 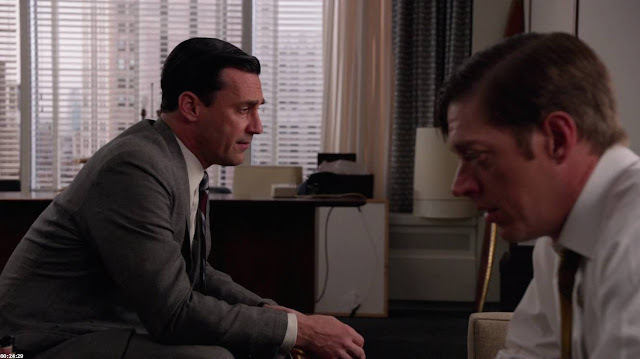 I’ll watch the episode (2-3 times), enjoy it (I mean, I enjoy basically every episode of Mad Men), understand the general themes and ideas going on, but I’ll still leave feeling a bit hollow or perplexed. Not necessarily because the episode was difficult or even bad, but just because perhaps something in the episode hasn’t completely resonated with my own life experiences—or my own crazy head ideas. “A Man With a Plan” was about a variety of things. It was about doubles. It was about repeating yourself. It was about having a plan and having it backfire; it was about not having a plan and having it backfire. It was about how plans and not having plans both eventually don’t matter because sometimes when you wake up in the morning the only news that you receive is news that Robert Kennedy has been shot; or that the police were having a shoot out with two maniacs in Boston. And all of this happens while you’re lying in bed planning out your weekend or deciding you need to take better control of your finances; or it happens while you are drinking coffee and deciding that you really should just let things be and go with the flow a little more. - Buzz Peterson’s plan to tell off Don and (especially) Roger. As last week’s episode exhibited, there is a fine line between having a plan for your life or your weekends and just freewheeling and ending up where your actions and intellect take you; riding a streak of luck into a job opportunity, a date, or a position of power. Just ask Augie March or young Don Draper. You can make all the plans you want, but nothing in your series of actions can completely determine what will occur in another person’s (very likely a stranger’s or, more painful and mysterious, a friend’s) series of actions. More often than not, you’ll have to cancel that reservation, but that doesn’t necessarily mean you should have never made it in the first place. Nothing happens in life without some kind of plan—no matter how vague—behind it. However, it is when we become reliant on plans or our desire to plan things out that things become dangerous. That’s when you start to repeat yourself; and no one wants to do that. By your senior year of high school and of college, you are usually ready to move on. That’s because after three or four years in the same place, seeing, talking to and avoiding the same people, you want new experiences. When I graduated college, I was relieved, because I felt I had already begun to repeat myself. There was only so much brooding I could do; only so many Stephen Dedalus poses I could strike along the walkways and corridors of my school. I knew that the only way I could continue to enjoy life; to avoid that feeling of repetition was to graduate and move forward out into the real world. This is obviously an experience shared by most people. In fact, most anyone in my generation has a nagging sense of not wanting to repeat themselves. We get antsy after barely a year in any job because we feel that we aren’t growing, learning, or advancing. We don’t want to sit at our desk for another identical year with the same title and nametag attached to our name. We want new titles, new offices, new responsibilities and challenges—we want newer and better salaries. Again, there is a fine line with wanting to move forward and with being comfortable with repetition. Very often, repetition breeds intimacy, while constant progress breeds loneliness and hides a fear of death. Repetition is what life is made of and we must embrace that repetition in order to embrace and accept death—because it is only through understanding our routines and our habits and what we have, that we will accept not having. “Red in the Face” from Season 1. - Robert Kennedy is assassinated like John Kennedy. - Don and Ted try to pair margarine brands to their Gilligan Island counterparts. Most of those examples are not stretches. This episode was all about doubles, alter egos and people repeating the same actions from years before, but just in a slightly different way. And, as we know, Don does not like to repetition; repetition is the same thing as a husband knocking on a front door rather than a sailor getting off a ship—it is not Eros. However, the irony is that this season Don is repeating himself more than ever. We are always going to be faced with the prospect of repeating ourselves or with moving forward and leaving what we knew behind. However, if you continue to move forward without valuing anything, without taking a moment to repeat yourself and to understand what it is exactly that you are doing and why—and perhaps even appreciating the merits of a certain routine—then you are destined to feel a sense of emptiness and constant dissatisfaction. The more you move forward, the more you move away from the origin, from the hearth, from where you came from. I’m not saying that in a merely geographical sense—I’m not calling for everyone to stay or move back to their hometowns. I suppose what I’m saying is that doing the next thing isn’t always the answer or the best thing. And neither is having date night every Friday or eating lunch at the same time every day. There is no right answer. There’s always going to be a Master and you’re always going to have to serve somebody. Routines become rituals and can very often be sacred. And variety is the spice of life. You can do your best to avoid cliché, but you’re going to have a hard time communicating with most people. In order to survive, you’re going to have to get used to ghosts.